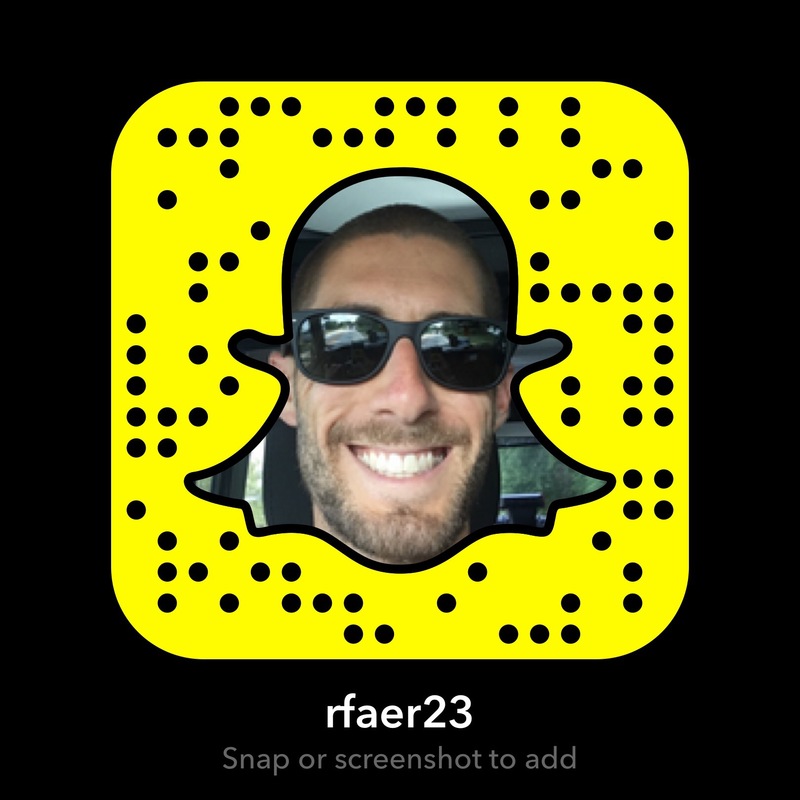 In the past month or so I’ve started using Snapchat as a new means of sharing content – both training and nutrition – and connecting with coaches/athletes. It’s a lot quicker, allows the person/athlete on the other end to know if you’ve opened their message (so they don’t feel ignored), it’s like a text message in terms of convenience (without having to give out your cell phone number), and there’s less of a chance of losing a question in the shuffle. Finally, it allows for quick multimedia answers, in addition to simple text, for more effective answers. 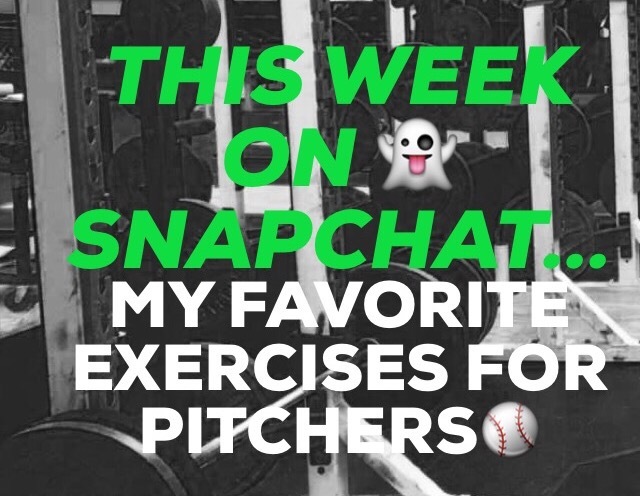 I wanted to take a few moments to compile that list of twelve exercises for those that missed out or don’t have Snapchat, and provide a brief, yet more in depth explanation of why I selected each one as well. P.s. I apologize for the image quality – they’re screenshots straight from Snapchat videos. Quite possibly one of my favorite movements for pitchers specifically, the Push-Up Complex could probably have a Movement Category all to itself. With so many variations (push-up, shoulder tap, stretches, mountain climbers, leg lifts, etc.) there is a lot of room to progress the movement so that it can be included year-round, while also controlling for pressing volume, which can be limited easily on the push-up itself by keeping the push-up reps low, while still getting in a ton of work in many other aspects by including multiple movements through this closed-kinetic chain (CCK) position. The CCK nature of this movement also forces the athlete to learn how to move and utilize the scapulae since they are free to move, unlike other pressing variations (e.g. Bench Press). When done properly, with both feet fully engaged with the floor, hips down and level on the bench, strong breathing, and the free arm unattached to any support (including the body), the Single-Arm Dumbbell Bench Press is an incredibly challenging exercise. Use it with a relatively heavy load and you’ll be left winded and feeling your entire body. While I’d prefer Push-Up Complexes over Bench Pressing, this variation’s challenging load (more so than a Push-Up) and anti-rotation components make it a favorite for me. While I like to control for overall pressing volume, this is another exercise that I will include in programming to balance out the movement profile of my programming, while also allowing the scapula to move freely. Also, the HK Landmine Press poses a challenge to postural control and alignment, so long as the athlete keeps the spine neutral. Much like the Push-Up Complex, the HK Landmine Press can also be progressed sequentially, and can actually be categorized as a “Reaching” movement, since we are reaching long through the scapula. The Reverse Lunge, in general, is one of my favorite lower-body exercises, as it is simpler for most athletes to first learn (as opposed to a Forward Lunge) and for its application to acceleration. Add in the towel/or valside and you get an added “pulling” component demand for the front leg’s glute and the back leg’s hip flexors. While it isn’t a baseline regression or a full-blown staple of my programming, the Transverse Lunge can be great tool in your exercise library to take a Frontal Plane movement (the Lateral Lunge) and add a Transverse component to it, bringing it a little bit closer to “pitching-specific”. You can’t talk about favorite lower-body movements without mentioning the Goblet Squat; it is an absolute must-have in my own programming, as it is great for athletes first learning to squat, those with mobility restrictions, and pitchers that you don’t want to Back Squat. I don’t think I need to say much else to justify the Goblet Squat. I’m a big proponent of relative strength and mastering body-weight, especially for younger athletes and novice trainees. While elevating the feet makes this an advanced progression, it’s great to implement once the athlete is ready for it. Not only does it challenge the Upper-Body, but by emphasizing the proper way to raise the hips during the movement, postural awareness is challenged as well. As for rotator cuff exercises and accessory “pull” movements, I’m a big fan of the Bent-Over W. Although I don’t include it in my initial programming (as it is quite challenging to hold that position while maintaining posture, and while sequencing it properly) I do love including it after some time in order to challenge the athlete’s glenohumeral rhythm as well as provide the external rotators some work. Another one of my staple movements, the RDL – whether it be barbell, dumbbell, or in the form of a good-morning – packs a lot of punch once it is learned. That is the caveat, though, as the Romanian Deadlift, or hip-hinging in general, is one of the toughest movements for novice trainees to master. But, this is why baseline regressions and teaching sessions are included right from the start in my programming. 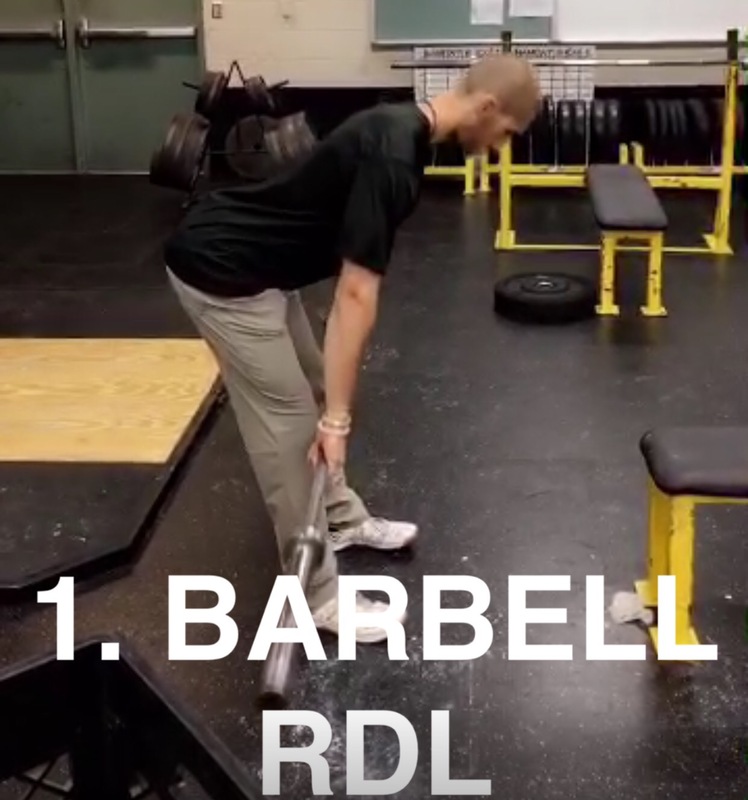 With its focus on the posterior chain, its demand on postural alignment, and its wealth of variations and loading patterns, you can’t find a much more valuable exercise to include than the RDL. 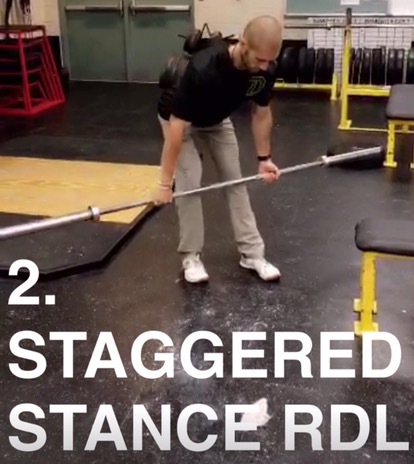 For the same reasons stated above for the Barbell RDL, plus a handful more, the Staggered-Stance RDL is one of my favorite hip-hinging exercises and my absolute favorite RDL variation. With the emphasis now placed more on one leg than the other, the Staggered-Stance makes this variation a great way to bridge the gap between a baseline Parallel Stance RDL and the Single-Leg RDL. There becomes a rotational component added as well. You can’t talk Lower-Body Hip-Dominant exercises without including one of the strongest muscles in the body and a major hip-extensor; the glute. 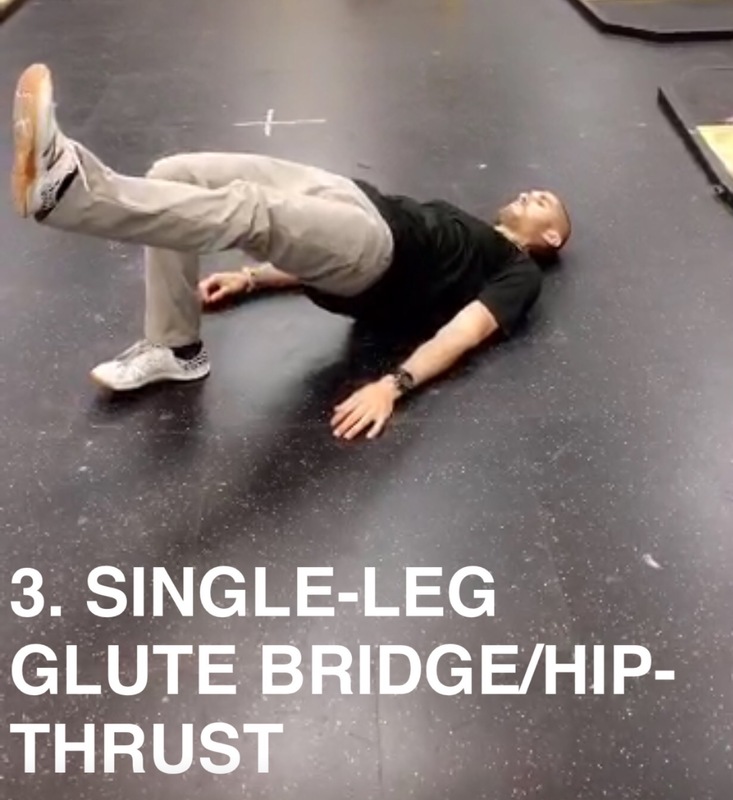 With the bent-knee position limiting hamstring involvement on hip extension, as well as the anti-rotational component added by going single-leg, the Single-Leg Glute Bridge/Hip Thrust is a great accessory lower-body movement, as well as an advanced progression of the standard Glute Bridge/Hip Thrust. Great content keep it up! Do you use different exercises for catchers since they are constantly stressing there knees? Lia, thanks for the positive feedback – and that’s a great question! I’ll be honest, to me it’s less about their knees, and more about their hips, ankles, and backs. Not that the knees aren’t important, but I’ll limit any knee-based movements only when they can’t tolerate them. As for the hips, since catchers are chronically stuck in hip Flexion (that deep squat position), I tend to do less squats than with any other player. Instead, I’ll opt for single-leg variations that force the hips to extend more (e.g. Step-ups, lunges, etc.) and lots of posterior chain movements to lengthen the muscles of the front of the body, while firing up the muscles of the back side of the body. As for the ankles, a lot of times you’ll see catchers who sit in their catching stances with all sorts of ankle positions (rolled in, turned out). And, quite often I see this manifest isn’t itself in their squatting patterns in the weight room. So, if and when I do implement a squat with a catcher, a lot of times it’s in order to teach them the safest positions to squat in. Finally, as catchers sit in that stance all game, fatigue will inevitably set in and of course posture will start to deteriorate. So, opening up the body in order to counteract hours in that closed off squat position is a priority as well. Hope all of this answers your question! Ryan: does getting stronger necessarily correlate to added velocity for pitchers? matched my pitcher son work incredibly hard in off season and when it came time to throw he actually lost velo. it was and is difficult to understand in light of all work he did. Great question. For starters, let me address your question specifically: no, strength does not necessarily correlate to increased velocity. Working backwards for a second: pitching a baseball at a high velocity is a movement that requires tremendous POWER. Power is the ability to apply as much force as possible, as quickly as possible. The ability to apply force is considered STRENGTH. Thus, strength is part of the equation – but only just that: a part of it. Strength serves as a limiting factor for velocity in the sense that, without adequate strength, we cannot apply as much force. Thus, we need to make up for that lack of force production with speed (e.g. arm speed) to create high velocity. That is why some pitchers, despite not strength training, can still throw with high velocity. But, to be as efficient as possible, strength is an important quality to possess. The more strength we have, the greater CAPACITY and POTENTIAL we have for increased velocity. That being said, potential only gets us so far. We must be able to translate that force into power by training the body to transfer a lot of force as quickly as possible. So, just because a player develops great absolute strength (e.g. a Deadlift 1-Rep Max of 600 lbs. ), doesn’t mean he can apply that to max velocity (hence why powerlifters don’t all throw 100 mph). There are also many other factors involved. For instance, if your son took the off-season off from throwing, or threw significantly less (which is a good thing!) then once he began throwing again his velocity was going to be down – despite all of his training – because many adaptations that increase velocity over time undid themselves during the off-season. But, it’s safe to say that, with a nice ramping-up of throwing volume gradually, his velocity will soon return, if not rebound slightly higher. This is only one consideration in a multi-factorial question – how do we best increase velocity? Mobility, mechanics, rest, recovery, and body weight all lend a hand as well. I hope this answers your question, Dan.